Meet the Authors - Kidpreneurs - Young Entrepreneurs with Big Ideas! 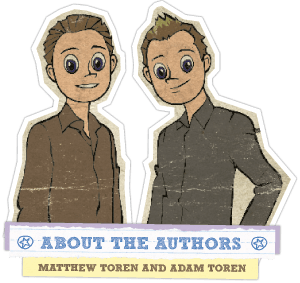 The Toren’s carry their tremendous entrepreneurial spirit like a torch, and are eager to pass it forward to the world’s youth while the flame is still burning. The brothers have spent years dedicated to researching the best practices in modern business and then teaching the techniques to others while also establishing and maintaining their own steady stream of successful businesses. One of their passions has been to help ailing businesses by passing along all they know. This entrepreneurial instinct, blended with an even measure of their altruistic nature led the Torens to found Young Entrepreneur, the largest and fastest growing social networking forum for young entrepreneurs. Stopped by nothing and often inspired, the Torens set out to author their own book to teach children the same principles they had been teaching adults for years. Kidpreneurs was born – a book that stokes a child’s desire to get involved in business early by fueling their curiosity in simple, engaging, creative, and safe ways.